Returned to Surftides for a weekend and were even more pleased than our last stay. We stayed in Room 328 which was recently renovated with wonderfully comfortable mattresses. The room had a nautical theme. There was a fireplace, balcony, a refrigerator with a separate freezer, a keurig coffee machine, and ample towels. We had planned to stay on the top floor (5), but this room was ready early so we gladly took it. It proved convenient in that it was close to parking and had a great view. It was surprisingly quiet......except for the sound of the ocean which was a delight. The front desk staff were very welcoming and efficient. We were given fresh cookies upon arrival and told about the new coffee machine in the lobby where one could get different types of lattes (free). The front desk also responded promptly when we noticed that our door lock was sticking and they sent maintenance to fix it within 5 minutes. There was also wine tasting on Saturday night and were introduced to a very good pear cider, pinot noir (Pendulum), and also a white wine. We used the hot tub and sauna, but the pool was too cold. We ate several times at Mist...the on-site restaurant. We also used the casino shuttle which was available after 4:30pm. Room tip: So many stay on the 5th floor that the 4th floor might have overhead noise. Although a little past their prime the rooms are large, comfortable, and well appointed with nice amenities. The personalized welcome note with cookies was a great way to start our stay. The balcony overlooking the beach was nice and the fireplace imparted a certain coziness. There is a swimming pool and a restaurant on site. The Quinault Casino is nearby and a shuttle makes regular runs for those who want to go over and try their luck. The area around Surftides is a nice area to walk and take strolls along the beach. There is a computer and coffee machine in the lobby. A real high point of a stay here is the staff. We interacted with front office staff, of course, but also housekeeping staff. Everybody was totally pleasant and fun.The sound of the surf was pleasant to go to sleep and wake up by. The only downer was the TV guide in the guest handbook which bore no resemblance to actual channels. No problem. If you can't find something to do here but watch TV, shame on you. Beautiful location- easy/quick access to the beach. Me and two friends booked a room as a last minute getaway for the weekend and our experience was fantastic. Room was pristine, more so than other hotels I have stayed at. Room included a keurig and a dvd player which was a plus, so we ended up renting a movie for the night. Only complaint was that there were no screens on the window which was odd. Overall this is a great hotel and we could have spent less elsewhere but happily decided to stay here instead. 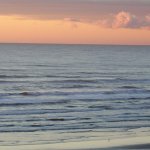 The location is one of the best in Lincoln City as well as being right on the beach. Rooms were good but outdated but comfortable. Had constant noise from above us so will request a room on the last floor next time. Bottom level is easy access to the beach but too noisy at 2:30 am as people are still walking around and making noise. Staff is friendly. We enjoyed the beautiful views from our balcony. The room was clean and the bed comfortable. The people at the front desk were friendly and accomodating. The facility was attractive and well kept. We would stay there again. Room tip: No A/C in rooms. Fans provided by front desk. Keeping slider open cools the room. The facility was clean and comfortable. We had no issues during our stay. Being on the 4th floor gave us a view of the sunsets that will not be forgotten. The bed was a little to soft for me but otherwise comfortable. Room tip: 4th floor for the views.